I arrived at Macushla House in Nairobi, and staff welcomed me back. It was my sixth visit and I was looking forward to their hospitality. I love Macushla because I can feed giraffes from a high platform just up the road and the Sheldrick Elephant Orphanage is only half an hour away. 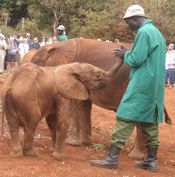 I went to see Mgegu, the orphan I adopted last year, and it was great to see his spear wounds had healed. One baby elephant was so excited to get his milk bottle he knocked over the wheel barrow and all the bottles fell over the ground. What a mess, but the staff were quick to solve the problem. The babies slurped up their milk and noisily asked for more. Some were so clever they could hold their milk bottle with their trunk. I adopted another orphan called Kamock and received a certificate and information about her rescue. In the afternoon I was invited to watch the babies return to their night stables and have another bottle of milk before going to sleep. 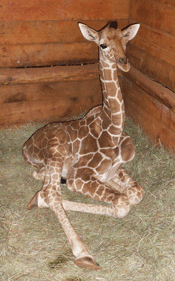 A baby giraffe had been rescued and he was adorable. The keepers put him in a stable next to Mbegu and he was very calm. An early flight on Safarilink and we landed after the pilot checked for animals on the dirt runway. Martin, my guide, was waiting for me to discuss what I wanted to photograph. 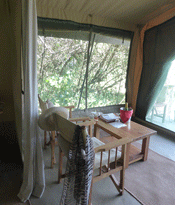 At Rekero Camp I had a pleasant surprise when I saw my tent had new Asilia-style furniture and water in the taps. Now, that is a new luxury! Peter and Stacey were great hosts and I was delighted to find a chilled bottle of wine from Troy, courtesy of True Africa. After a healthy lunch, Martin found good action for me to photograph and video for Ziggy the Zebra. Back at camp after a great morning I had a shower, which was a bucket of warm water tipped into the bathroom area in my tent. Bliss! It was great to wash off all the dust and dirt. When I was ready for dinner, I wiggled my torch up into the sky and a Maasi escorted me to the dining tent, then after dinner he walked me back again. It was too dangerous to walk at night without a guide. During the night the sounds of hippos honking and hyenas with their long howls and strange whooping sounds kept me awake, but I didn’t mind. I was back in Africa! The next three days were fabulous. 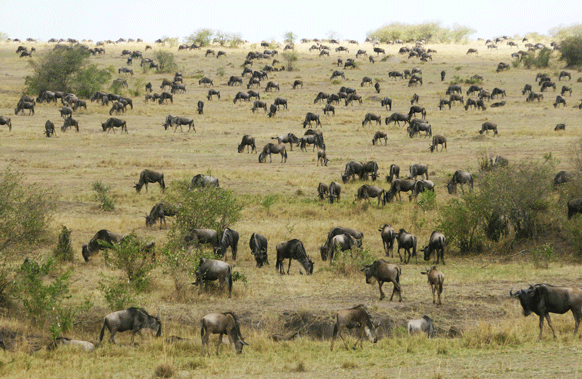 There were thousands of wildebeest on the Mara side, they had not yet made the perilous crossing to the Serengeti. They nervously waited by the river and when something spooked them they galloped back to the plains. Every morning lions were close to the jeep and it was exciting to photograph them in the golden morning light. Notch had gone and his four sons had taken over the pride. 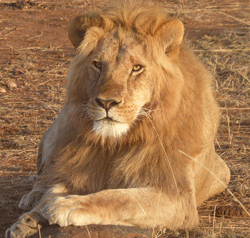 We watched six young lions tormenting a huge buffalo. The buffalo got annoyed and chased the lions away. It was a wonderful morning drama. It was an unusual sight to see a leopard mother using a warthog’s hole to protect her cub, and a thrill to see a cheetah mother with three cubs all entwined around each other. I sadly left Rekero Camp for a two hour drive to Encounter Mara Camp. 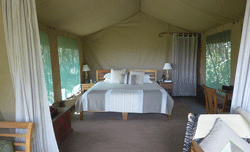 My tent was very comfortable and I had a great view of all the animals trotting past. Wilson was my new guide who looked very young, but I discovered he was 30 years old. I explained I’d almost finished my zebra video but needed some more action. 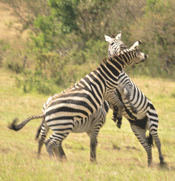 He drove to a herd of grazing zebras and immediately they started nipping each other, had a friendly fight and galloped away. Wow! That was amazing! Wilson knew where a lioness had killed a warthog to feed her cubs. We watched her hide the warthog in thick bushes so animals couldn’t steal it. Now I had to say goodbye to Africa. 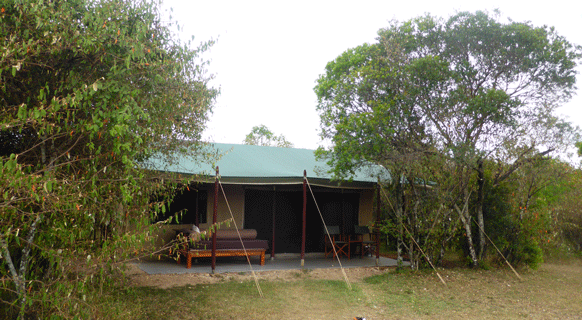 It had been a wonderful trip with great staff, fabulous food, comfortable tents and the excitement of seeing animals in the wild.